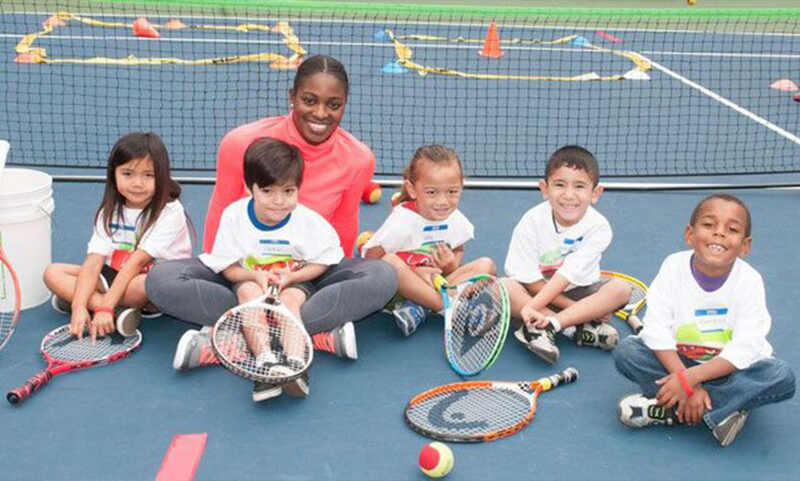 Over the past year, the Sloane Stephens Foundation has partnered with the LA84 Foundation/NJTL Program to develop a “Get more youngsters playing” campaign. “LA84 Foundation/NJTL, along with the Southern California Tennis Association Schools Program, has worked with the Compton Unified School District (CUSD) and the Sloane Stephens Foundation to introduce tennis at the elementary school level,” said Melanie Bischoff, SCTA Director of Community Tennis. “Ten schools including – Davis Middle, Dickson Elementary, Emerson Elementary, Foster Elementary, George Washington Elementary, Jefferson Clinton Elementary, Kelly Elementary, Roosevelt Elementary, Roosevelt Middle and Rosecrans Elementary – received 10 and Under Tennis Line Grants to install painted lines on their playgrounds. Sloane Stephens is comfortable working with youngsters just beginning to play. Many readers are probably aware that Stephens is dynamic. The word applies to her public presence as well as her tennis playing ability. The 22-year-old, who finished the year with a WTA ranking of No. 30, grew up in Fresno, but now spends down time in Los Angeles, when she isn’t training in Florida. Bischoff enthused, “This is an exciting time to be working with the Sloane Stephens Foundation and Compton Unified School District. Giving kids the opportunity to play tennis in school is a priority for the SCTA. It is so important for children to start playing tennis at a young age so that they can immediately learn about the fun the game provides and with a start like this, they will continue to play, and enjoy tennis and the fitness aspect for the rest of their lives.